Photo credit: Jeff Burrell/Wildlife Conservation Society. 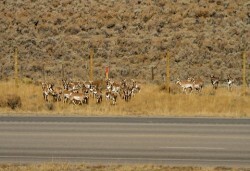 Pronghorn using a newly opened overpass crossing Highway 191 at Trapper’s Point, Wyo., this fall. Until recently, the population of pronghorn — a small antelope-like mammal endemic to North America — outnumbered people in its native Wyoming. The Cowboy State may be the nation’s least populous, but the two groups still manage to come into conflict. 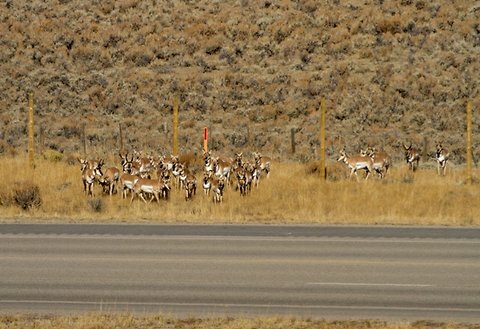 Pronghorns numbering in the tens of thousands cross Highway 191 each year during their annual migration, and collisions between animals and cars are costly for all involved. 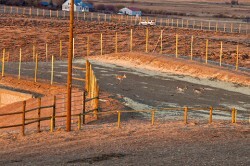 Now conservationists are celebrating the apparent success of an experiment involving a series of new wildlife overpasses that allow the pronghorns to cross to safety while freeing up the roads. In the days of Lewis and Clark, millions of pronghorn populated the western frontier. But even by then, only one species, Antilocapra americana, had managed to avoid extinction. Today, A. americana’s population hovers around 700,000. And of those remaining pronghorns, more than 50 percent are found in Wyoming. “It’s a pretty spectacular animal, and with Wyoming being the last stronghold of pronghorns, its important to protect their long distance migrations,” Dr. Beckmann said. A diverse team of collaborators formed to create the highway overpasses, including the society, other nongovernmental organizations, universities and state agencies like the Wyoming Department of Transportation. “This really shows that when a diverse set of constituents come together to solve a common problem, really neat things can happen,” Dr. Beckmann said. To get the project off the ground, he and and his colleagues first identified the sections of highway where pronghorns most often cross during their annual trek between the Upper Green River Basin and Grand Teton National Park. 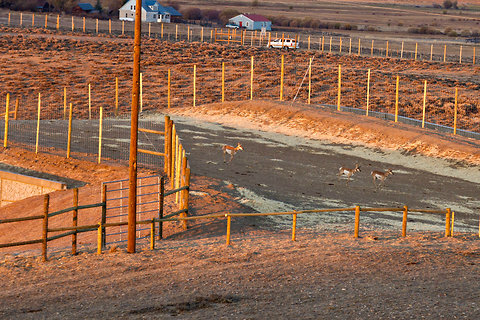 The researchers outfitted 400 pronghorns with G.P.S. collars that transmitted geographic tracking points eight times a day over five years of migrations. This allowed the scientists to map the so-called “Path of the Pronghorn,” a migration corridor that has been used by the animals for 6,000 years. (Each animal travels roughly 90 to 125 miles each way in the spring and fall, although the corridor itself is longer.) A significant stretch of this route is the only federally designated wildlife corridor in the United States. After identifying the animals’ favorite crossing points, the conservationists passed their data on to engineers who overlaid the points onto highway maps to select the ideal spots for constructing the overpasses. They lined the side of the highway with an eight-foot-high woven wire fence to funnel the animals into two newly constructed safe passage points. The overpasses contain features like sagebrush that mimic features of the pronghorn’s natural migration trail, and the bridges’ sides are lined with bushes so that the visually oriented animals do not fall off the edge or get distracted by traffic rushing below. The researchers are collecting their first year of data from the newly opened overpasses, and they have already documented successful pronghorn crossings. “We’re ecstatic,” Dr. Beckmann said. In addition to the overpasses, the collaborative organizations worked together to create six underpasses along the same stretch of highway. Dr. Beckmann predicts that animals besides pronghorn that favor wide open spaces will use the underpasses. “Any other species that comes up against the road can use these, including coyotes, bobcats, mountain lions, moose, mule deer, whatever,” he said. He and his colleagues hope this newest series of wildlife corridors helps encourage similar efforts in places across North America where interest in such projects is beginning to pick up. Photo credit: Jeff Burrell/Wildlife Conservation Society. Pronghorn waiting skittishly to cross Highway 191 in Trapper’s Point, Wyo. last year.